Menlo Group Commercial Real Estate has successfully negotiated the lease of a 40,000 sq. ft. space in Chandler. Tempe, AZ, October 02, 2018 — Menlo Group Commercial Real Estate has arranged a six-year lease for Offerpad, a tech-enabled real estate company, at 2150 E. Germann Rd. in Chandler, Ariz. 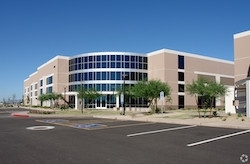 The property, which is located near the Chandler Municipal Airport, will serve as Offerpad’s permanent headquarters when the company moves in early next year. The nearly 40,000-square-foot space will meet the demands of an ever-growing staff. Milne first worked with Offerpad when the company moved into its current offices in Gilbert. He was also involved with the opening of Offerpad offices in cities such as Atlanta, Las Vegas and Orlando. Since its inception in 2015, Offerpad has participated in thousands of real estate transactions and is projected to purchase and sell $1.5 billion in single-family homes over the next year. Menlo Group Commercial Real Estate is a full-service brokerage specializing in retail, professional office, medical and dental office, industrial, childcare and investment markets throughout the Metropolitan Phoenix area. Menlo Group exists to illuminate the path to success for its clients, advisors and employees. Learn more at www.menlocre.com.